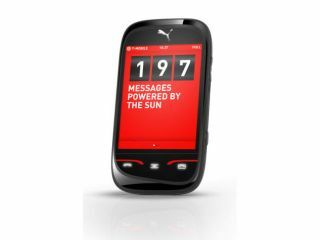 Sagem has chosen Mobile World Congress in Barcelona to show off its latest handset – the Puma Phone. You would never guess with the name but Sagem has teamed up with Puma – crazy, we know – to unleash this beast of a phone which, according to Sagem, "encourages an active way of life both digitally and physically." As far as we can tell this means adding a Puma logo to the back and the top of the device to make it look a bit sporty, which is akin to adding go-faster stripes to a car in a bid to make it, well, go faster. To be fair, there are some sport-related specs under the bonnet. These include a pedometer, GPS tracker and stopwatch and it will play a multitude of music file formats to keep you running and an integrated FM radio. The phone also packs in a 2.8-inch touchscreen with 240 x 320 QVGA resolution, a 3.2 megapixel camera with LED flash and VGA video camera. Connectivity comes in the form of 3G, Bluetooth and USB 2.0 and the phone weighs in at a rather light 115g. It's also packing a solar cell which is actually really handy. As it is Puma through and through, you will also be able to interact with multimedia content from puma.com, download Puma applications, and access Puma products. Oh, and Puma has also branded the menu screen just in case you forget to look at the phone's chassis and realise that the company has its paw prints all over it. The Puma Phone has a UK release date of April, with pricing and network availability to be announced.